I’m not sure where I’ve been. Or where December went. Or even when it got here. Suddenly, it is the Eve of Christmas Eve. What the what? Not much happened the first few weeks of December. I went to the gym at least four times a week. Lost no weight at all. Possibly had a few handfuls of Nestle chocolate baking chips (As in stop eating them straight from the bag, freak!) to deal with my frustration. There was karate. And art projects. House cleaning. And some baking. Netflix. And even a holiday party or two. Everything was pretty ho hum. And then Wham! Bam! Pow! First, our nanny went back to Mexico for at least three months. She isn’t sure if she is returning at all, actually. I was emotional enough about her leaving, but then she wrote this card. The kind of card that I will keep for my entire life. That kind of card. The kind that had me sobbing so hard you would have thought someone killed my puppy. (If I had a puppy.) She wrote the kindest, most thoughtful things about all four of us and it just about broke me. I never even wanted a nanny. Before we had kids I told my husband I didn’t want to have any help. The way he grew up, it is normal to have a nanny and house cleaner so he fought me a bit. I caved and said maybe, maybe part time and she had to be really old and ugly. Next thing I knew I had a young, beautiful woman in my house all of the time helping me take care of my kids when I had to work. And it was wonderful. Because she truly loves my kids. It is so incredibly special to know that when you can’t be there, the person caring for your kids actually loves them and enjoys being with them. She told me so in part of her card. So, my heart broke a little when we said good bye. And then, the next day, we got swept off to Disney World by one of the three sets of Grandparents. It was fabulous – so fabulous that it needs its own separate post that will be coming shortly. We went from lots of sadness…to stepping foot into the Happiest Place on Earth! Intense. And because we don’t believe in anything but extreme swings of the pendulum in this family, we came home with fevers, vomiting and mouth sores, yippee! Yes, folks, despite what you may believe, there are germs at Disney. Shocking, I know. What mom doesn’t like to hear the word ‘Coxsackie’ five days before both sides of the family arrive for Christmas Day? I was super excited when the pediatrician diagnosed it. Awesome! You know what? That was totally going around Carlitos’ preschool last year and we managed to miss it so I’m wicked excited to try it out! Something new! OOOh, and lace-like rashes may arrive in a few days? How pretty! We will look like three little wrapped up Christmas presents, all red and lacey and….blistery. Hmmm…. So December kind of crept by me quickly like a stealth Christmas elf and then SMACK! it hit me in the face with all kinds of intensity in it’s final moments. Kind of like one of those sneaky Elves on the Shelves, like this one. 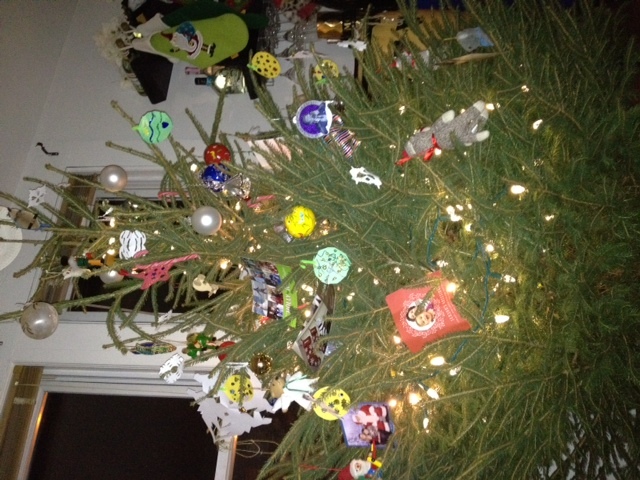 And honestly, I think our tree kind of reflects the craziness, joy and memories of this December and this year. First of all, all ornaments have rearranged no less than 78 times. Credit goes to Carlitos and Xavi for that. Mostly Xavi. Second of all, at this point, there are no more ornaments on the bottom of our tree. They have either been broken or almost broken and then moved up to higher tree limbs by mommy. Credit goes entirely to Xavi on this one. Third of all, we could only put on about five of our glass ball ‘filler’ ornaments, as those were sure to be immediately shattered as well. Again, Xavi. He’s worse than the damn cat with this tree! So, to fill in our naked tree we began putting our Christmas cards on there. Husband’s idea, but I love it. And then Patricia, before she left, helped the boys make beautiful, glittery paper ball ornaments. Lastly, today Carlitos and I made snowflakes and he decided to hang them all over the tree. Apparently, the reason Christmas is his favorite holiday is because it means ‘the snow days’ are coming. Silly me, I thought he liked it for the presents. I should also mention that we cut down our own tree. Which I think makes it even more ‘us.’ Not in a romantic, We Are So Awesome and Wholesome kind of way, but more in a We Do Everything the Hardest Way Possible and Call it a Memory sort of way. So, even though it is a bit scraggly, is undressed from the pants down, and has clusters of ornaments next to awkward vacant expanses, I love it. Because it also has photos of people that we love, ornaments made by people that we miss, and snowflakes made as a family. Happy December, everyone! And remember: Wash your hands, wash your hands, wash your hands! 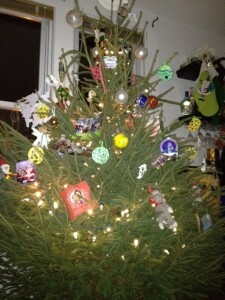 This entry was posted in Real: my personal trials, tribulations and tales and tagged Christmas Eve Eve, Coxsackie can coxsuckit, I love our nanny, wacky Christmas tree. Bookmark the permalink. Follow any comments here with the RSS feed for this post. Post a comment or leave a trackback: Trackback URL. We had to put a ban on Cal going near the tree. She insists on clustering all the ornaments on one side of the tree. I have no idea why. I asked her. She has no idea why. Jan 1….so darn close I can taste you. I’m so happy I got to meet you this year….looking forward to crossing paths again..and maybe causing some trouble with you. xo.